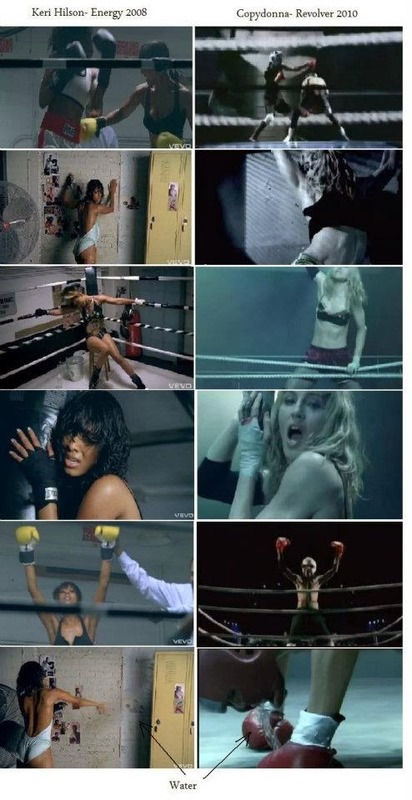 Madonna's video for 'revolver' is just a copy of Keri Hilson's 'energy'. Her shows from Dry and Bitter Tour which also consists these scenes were before 'revolver' music video, however Keri's one was still before this copy. There are a few videos with boxing theme (Raffaella Carra had one) but not so similar. Copydonna does the same things as Keri( pulling the strings, dancing in front of wall, slopping the water..), has the same poses.